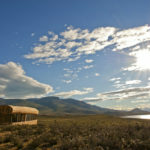 Created in 2013, Awasi Patagonia is the new kid in town and their unconventional approach to Patagonia lodges seems to be winning guests over 12 villas at a time with unique design, location and services. Following in the footsteps of its sister lodge, Awasi Atacama, it was given the stamp of approval by Relais & Chateaux, an association of the world’s finest hoteliers. This Patagonia luxury lodge sits on the former campsite of Florence Dixie, a British adventurer who explored Patagonia’s peaks and pampas in the late 19th Century. It is now a 14,826-acre private reserve. The benefits to this location that were true back then still hold true today. Awasi is outside the park, nestled amongst a dense forest, offering refuge from Patagonia’s strong winds while enjoying breathtaking views of the Torres del Paine peaks and Lake Sarmiento. Awasi is made up of 12 freestanding villas (11 with one bedroom and one with two) as well as a main lodge. Built using locally sourced wood, the villas were designed by Chilean architect Felipe Assadi to resemble classic Patagonia shelters/ranching posts. Their outward appearance is purposely unassuming, so as not to take away from the natural surroundings, while the inside hosts a perfect balance between luxury and simplicity. If you are in it for the views you won’t find a bad one here. The walls, abundant in large windows, are designed to bring the outside in. With comfort in mind, each villa is well furnished with a cozy fireplace and a wood burning hot tub boasting unrivaled panoramic views of Patagonian landscapes. A ten-minute walk or an on call pick-up service will get you to the main lodge where you will find the reception, restaurant, relaxing lounges and oversized fireplaces. Chef Frederico Ziegler runs the restaurant and creates custom menus with locally sourced gastronomy easily tailored to guest’s needs or dietary restrictions. Other than the unique location of Awasi, it stands out for delivering premium services to its guests. They have pioneered completely customizable itineraries tailor made for your taste and timing. They provide you with your own 4×4 vehicle and a private guide at your service. You can go where you want, when you want. Choices range from off road drives, horse back riding, trail hikes, boat rides, photographic safaris, and wildlife/bird watching. Guests have the freedom to choose from over 24 half day and 13 full day excursions during their stay. Awasi’s location outside of the park puts them on the cusp of lesser-visited landscapes. Their excursions include some fantastic off-the-beaten-path treks with more opportunity to see wildlife such as puma than some more trodden parts of the park. Rather than a detriment, we find the private location beneficial to having a phenomenal Patagonia hiking trip. All in all, Awasi is perfect for the adventurer who is seeking privacy, boutique services/amenities, and is used to customizing their own schedule. It is a great option for an excellent luxury Patagonia trip. 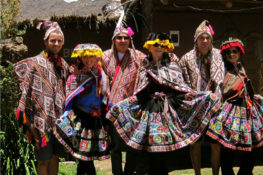 Be sure to check out Awasi’s sister property Awasi Atacama for the same impeccable service when traveling in the Atacama Desert of Northern Chile. For more information on lodges in Torres del Paine check out the overview of multiple properties in our blog post Best Patagonia Luxury Lodges. Jack is a Trip Specialist at Knowmad Adventures, a company dedicated to creating unique, private and custom trips in South America. He has an affinity for anything outdoors and is constantly on the move trying to stay curious and active. Read Jack’s biography and more about the Knowmad team. Book Awasi today and save big! Knowmad is offering an exclusive deal at Awasi, Patagonia’s newest luxury lodge. If booking between now and the end of August in addition to the best rates available at Awasi, we are offering a $200 per person credit for additional Chile land services. * Call or email today for details and pricing. *Offer available only for 4-night stays and longer. $200 credit can be redeemed only as price reduction for services outside of Awasi package cost. Please note: Awasi Patagonia requires a 3-night minimum stay, and is a seasonal hotel, open September to May.